China's Passenger Car Association reported last week that retail sales of various vehicles totaled 1.78 million units in March 2019. The total was 12% less than the number of automobiles sold in March 2018. This matches the government's data, both sets very clear as to when Chinese economic struggles accelerated: May 2018. China's Passenger Car Association reported last week that retail sales of various vehicles totaled 1.78 million units in March 2019. The total was 12% less than the number of automobiles sold in March 2018. This matches the government's data, both sets very clear as to when Chinese economic struggles accelerated: May 2018. For decades, there was just one way for China's car market: up. Once the trend abruptly reversed 10 months ago, the free fall in the world's largest market has shown no signs of easing. Even in one country the world has been counting on for "globally synchronized growth," sustained setbacks in the very nation which should be unambiguously booming, anything above zero will be super-hyped regardless. Put a plus sign in front of any single piece of Chinese data and let the spring season take it from there. 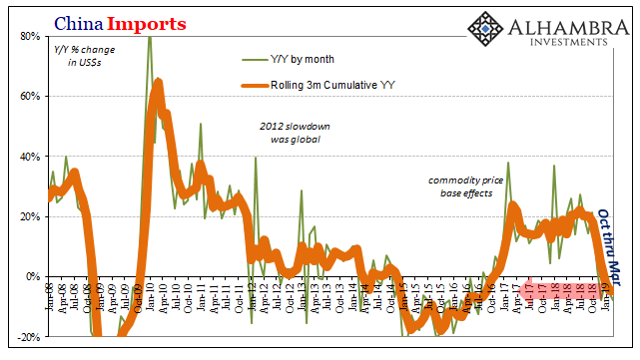 That was China exports last month. Also last week, China's General Administration of Customs said that the total dollar value of exports leaving the country in March 2019 was 14.2% greater than the dollar value of goods exported in March 2018. 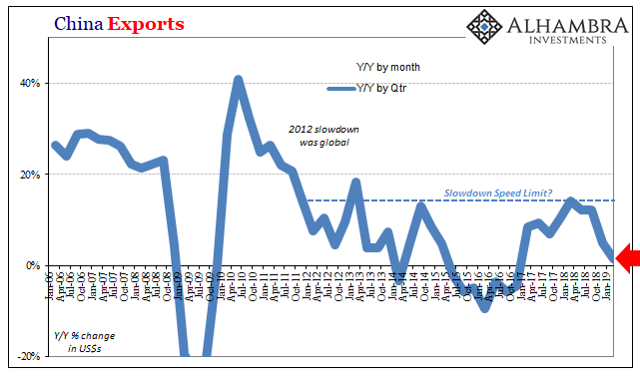 Exports in February had been down 20% year-over-year. Like China's manufacturing PMI, the +14.2% was broadcast as if the only thing that mattered. The problem, as usual, is Golden Week skews. In 2018, last year's March exports fell 2.7% year-over-year after rising 44.5% the previous month. This year the pattern is reversed, leaving only a simple calculation to gauge the overall baseline. And that is the quarterly combined figure. In all of Q1 2019, exports rose by just 1.3% compared to all of Q1 2018. 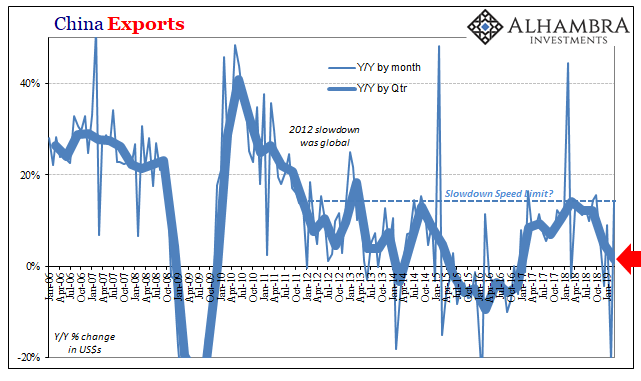 That's actually down from Q4 when total exports from China gained 4.8%. Exports haven't collapsed despite "trade wars" but what matters is the trend toward which everything points. The global economy isn't doing all that well, either. Over on the far more important import side, it is still very red. 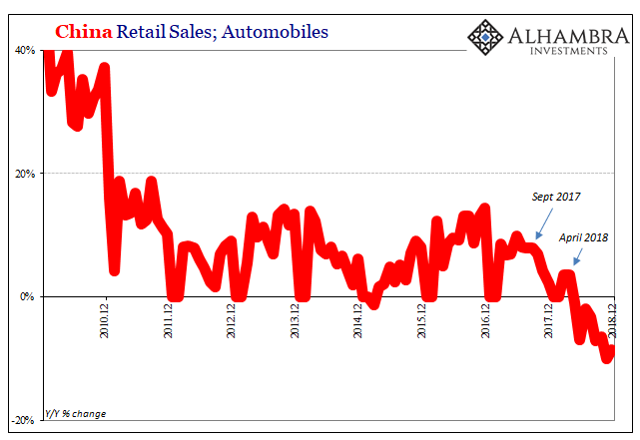 As you can tell by the trajectory of car sales in China, the internal economy there is under severe strain. In that sense, and only that sense, the export figures are helpful in ruling out "trade wars" as the real cause of this ongoing stress. For the quarter, total imports were 4.7% below what they were in Q1 2018. That's down from +4.8% in Q4 and +20.2% in Q3. On a quarterly basis, Chinese imports haven't been negative since Q3 2016. 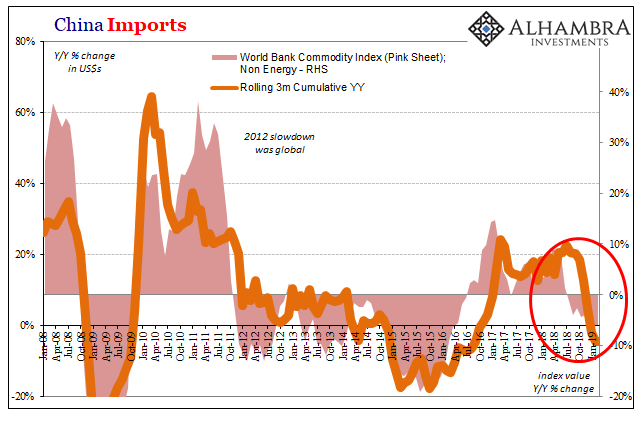 The RRR cut signals that the reserve problem therefore dollar problem is anticipated to grow worse. The PBOC is actually telling us that they expect in the months ahead the same or perhaps bigger commitment to "stepped up support." CNY doesn't need support if there is no worsening "capital outflow" situation of retreating eurodollar funding. This will require more monetary contraction in bank reserves than we've already seen. The central bank is forecasting more problems ahead. There were two additional cuts to the RRR in January 2019. In the mainstream, these were reported as "stimulus," the basis upon which many expectations for any sort of green shoot have been built. Again, realizing what they actually mean, the RRRs therefore signal quite the opposite - what the data is actually displaying. Car sales and imports, China's economy is not (yet) crashing but it is falling down again for the first time since Euro$ #3. In other words, Reflation #3 in between never made it past last May 29. Economy and markets. It's not quite the same as +14.2% exports.